Haarlem, the provincial capital of North Holland, offers day-trippers a leafier, less crowded alternative to Amsterdam. Handsome 17th-century architecture, secluded hofjes (courtyards) to explore, and a number of fine museums make Haarlem a superb destination – one that's only 20km from Amsterdam. If you want to fly from Schiphol (Amsterdam) Airport, take bus 277 or 300 (direction Haarlem) to the Central/Verwulft stop (about 30 to 40 minutes). Those who prefer the train must transfer at Amsterdam Sloterdijk to continue onto Haarlem. 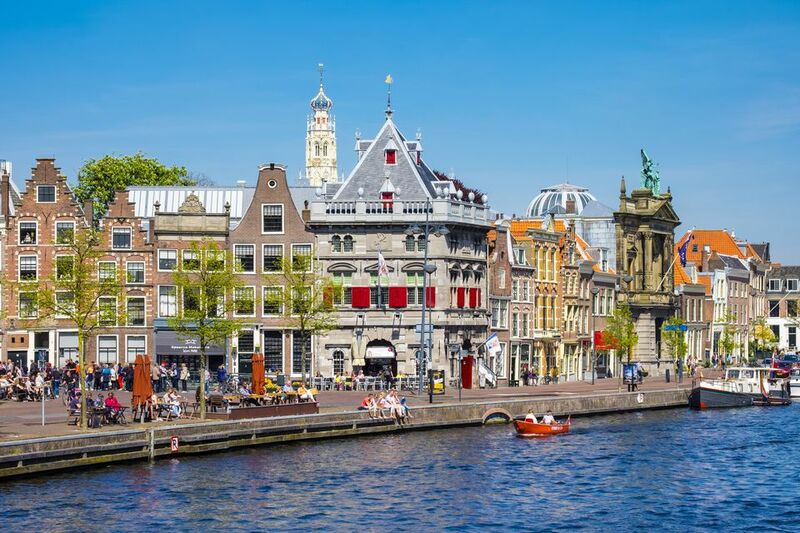 By train, Haarlem can be reached in 15 minutes from Amsterdam Central Station. If you're feeling really adventurous, why not hop on a bike? The bicycle route from Amsterdam Central Station to the Grote Markt, Haarlem's main square, takes about 90 minutes. Bicycle rental services are available all over Amsterdam. Stroll about the Grote Markt, Haarlem's main square, whose daytime market stalls and museums secede to cozy bars and eclectic restaurants after business hours. Its crown jewel is the Gothic Sint-Bavokerk (St. Bavo Church), whose quirky interior details and world-famous Christian Mueller organ definitely warrant a visit. Most of the square's monumental architecture is now home to temporary exhibition spaces: De Hallen and the Vishal showcase modern and contemporary artists, while the Historical Association of Haarlem curates exhibits on older Haarlem in its headquarters, the Hoofdwacht. Explore the hofjes, the immaculately manicured courtyards that are the pride of Haarlem. The information portal Haarlem Shuffle provides a list of the most popular hofjes. See the first and oldest museum in the Netherlands, the Teylers Museum. Established in 1784, the Teylers Museum has been dubbed a "treasure room for art and science" because of its eclectic permanent collection, from fossils and skeletons to Old Masters and more. Admire the Old Masters – far from the Rijksmuseum crowds – at the Frans Hals Museum. Frans Hals, a native son of Haarlem, is featured beside other 16th- and 17th-century masters like Martin van Heemskerck, Judith Leyster, Jan Steen and others. Go mad at Het Dolhuys. Het Dolhuys – Dutch for "The Madhouse" – is the national museum for psychiatry, whose mission is to explore the definition, perception, and boundaries of madness in its provocative temporary exhibits. Revelers from all corners of the Netherlands turn out in droves for the annual festivals and other events held in Haarlem, some of the most beloved in the country. Bevrijdingspop: Haarlem celebrates Liberation Day (May 5) with Bevrijdingspop, or Liberation Pop, a 12-hour music festival on the arbored lawn of Frederikspark. Two podiums for diverse musical acts, market stalls for retail therapy and a special children's festival make this an event that appeals to all persuasions. Haarlem Jazz Stad: Jazz enthusiasts will know Rotterdam's world-class North Sea Jazz Festival, but did you know that Haarlem Jazz Stad is the most popular free jazz festival in all of Europe? Acts from the Netherlands and abroad perform for thousands of fans over five days in August. Stripdagen Haarlem: The biannual Stripdagen Haarlem (Haarlem Comics Days) is the premiere comics festival in Northern Europe, and entrances visitors with the diversity of comic art from around the world. Round off your day in Haarlem with a meal at one of the city's distinctive eateries. Stellar restaurants line Haarlem's cobblestone streets, but here are some real stand-outs. Erawan: The Thai Ministry of Commerce conferred its "Thai Select" award on Erawan for the supreme authenticity of their dishes. All the classics are represented here, from piquant tom yum (prawn soup) to flavorful pad thai (Thailand's national noodle dish). Jai Bharat: Reviewers are unanimous that Jai Bharat, opened in 2009 just behind St. Bavo's Church, serves the most exquisite North Indian cuisine in town. Kick back with a lassi and one of their classic curries in their chic but cozy atmosphere. De Bokkedoorns: For the most transcendent culinary experience in or around Haarlem, book a table at De Bokkedoorns in the picturesque dunes of nearby Overveen, whose nouveau Dutch menu has earned it two Michelin stars. When it's time for a mid-day snack, head to one of these local favorites. Anne & Max: A perennial favorite for their fine coffee, irresistible pies and cakes, and sandwiches loaded with the season's best products. Crowded on weekends. Haerlemsche Vlaamse (Spekstraat 3): Bar none the best friet (French fries) in Haarlem, with a wide variety of peculiarly Dutch and Flemish sauces (peanut sauce, anyone? ), and centrally located on the Grote Markt. IJssalon Garrone (Grote Houtstraat 179): Classic Dutch tastes, like speculaas (gingerbread) and stroopwafel (syrup waffle), are transformed into ice cream at this local institution. Isolated for Centuries, This Town Still Marches to Its Own Beat. The Story of the Holiday Formerly Known as Queen's Day.